The Best Fundraiser Event You'll Attend This Year! 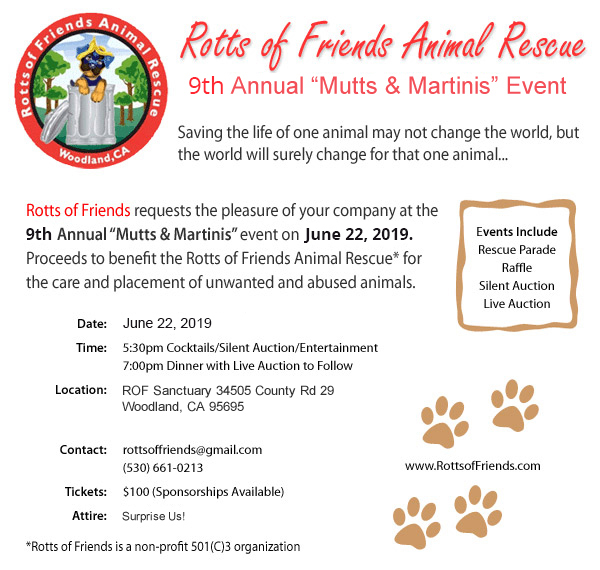 Join Rotts of Friends for an evening entertainment and canine companions and lend your paws for the cause of helping our needy rescues. We have many wonderful rescues available. You can preview most of the rescues on our website www.rottsoffriends.com, but it may not be complete as we get new intakes regularly. The best thing to do is to contact Renee to discuss your particular situation and which rescue may be a good fit for you or you can just show up during our regular adoption hours to meet the rescues and we can work with you to find a good match. We have regular adoption hours Saturday between 8am-11am, or by appointment. We are not usually available on Sundays. Getting a dog is an important decision, and all members of the household must be present (including children). If you have another dog, you must bring them with you in order for us to evaluate whether one of our rescues will be a good fit for your family. We suggest having them crated in the car. If you would like to come out during regular adoption hours, you can call to let us know (leave a message if we do not answer) or just show up during the adoption hours. If you do find someone to adopt, the adoption donation is $250, which helps Rotts of Friends offset the costs for spay/neuter, vaccinations, microchipping, and boarding. Proof of home ownership such as a mortgage statement or property tax bill is required. If you rent, you must bring proof you are allowed to have a dog in your rental, such as a letter stating landlord permission. The sanctuary is located at 34505 County Road 29, Woodland, California. As an added benefit, all of our rescues come with free lifetime obedience training.